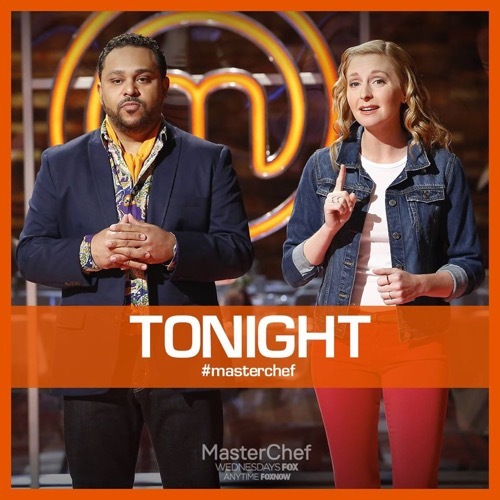 Tonight on FOX Masterchef returns with an all new back to back Wednesday, August 31, Season 7 episode 14 & 15 called, “Tag Team; Pop-Up Restaurant,” and we’ve got your MasterChef recap down below! On tonight’s episode in the first half of a combined episode, three basic utensils are used by the Top 7 contestants in a mystery-box challenge. On the last episode, guest judge Kevin Sbraga cooked alongside the Top Nine in the next Mystery Box Challenge, as they created an impressive dish using unique upscale ingredients. Did you watch the last episode? If you missed it, we’ve got your MasterChef recap right here for you. Chef Ramsay called the remaining contestants on tonight’s episode of “MasterChef” the Magnificent Seven. He had called them that because they had managed to beat out the out their former friends and foes in recent weeks and were surprisingly still standing after last week’s hellish episode however, tonight the judges decided to once again up their game because they wanted the Top Seven to prove their worth. And unfortunately what they ended up proving with tonight’s Mystery Box Challenge was just how far some of the contestants still had to go before they could truly be a MasterChef Winner. The Mystery Box Challenge was simple. The contestants were first given the bare minimum of utensils. Such as a knife, a wooden spoon, and a skillet and then they had been told to create a restaurant worthy meal with only those tools. So to remove temptation, the equipment room was put on locked down. No one could get into there but they could all imagine the things they could do if they had just been allowed in and were able to grab what they needed. However, with their three kitchen tools, many did rise to the challenge therefore, they were able to deliver on a high-end restaurant meal and even impress the judges. But in the end, none of the contestants could match Chef Ramsay. Ramsay had done the challenge along with the contestants and he had managed to cook up both an appetizing entrée as well as a delicious desert. So some had tried to emulate him when they saw what he was doing by cooking up both as well and sadly what they had didn’t work. Which because obvious when they weren’t called when it came time for the judges to pick the Top Three. The Top Three were actually Tanorria, Brandi, and David. Tanorria and Brandi had gone back to their traditional southern roots and had showed how versatile they were with a cast iron skillet. Yet, Brani had done just a tad more when she managed to pull off several cooking techniques with that one skillet. So really the judges chose well when they picked Brandi as tonight’s Mystery Box challenge winner though later Brandi showed that she could be just as devious as everyone else when it came to her advantage. So Brandi was dangerous after she had gotten two advantages. She was told that she free from cooking in the later Elimination Challenge so that was expected however her second advantage gave her the opportunity to choose who would be paired with the who in the Elimination Challenge. The Elimination Challenge required teams of two to recreate the perfect picnic dinner and so it was imperative that the remaining contestants had a partner that could help them. Though she truly hadn’t been fair when she paired Nathan with Shaun. Nathan and Shaun had worked together before and it had been a disaster. Nathan didn’t like listening to people or following directions because he became easily frazzled yet Shaun was a go-getter. Shaun was confident in the kitchen and with his own work. So sometimes he forgets if he’s working someone that he has to work with that person and not just hand out directives. However, to be fair to Shaun he had tried to bench that sort of behavior when he found out that he was being paired with Nathan. But despite his best intentions, Shaun and Nathan’s team was all over the place. David had been paired with Katie and Tanorria had been paired with Dan, but none of those teams struggled like Nathan and Shaun. Nathan tended to get slower the more he was frazzled so Shaun had first tried to rush him and then eventually tried to do the majority of the work when he realized that Nathan couldn’t pull it together. So the judges actually stepped in at one point to see if they could get Nathan to calm down a little in order to stay on in the competition. The judges had talked to Nathan, Ramsay had even handed Nathan a bottle of water, yet Nathan ended up passing out because of the anxiety attack he was giving himself. So unfortunately, that was a new low for the contestants. Nathan had showed that he couldn’t do well under pressure and to be frank the others hadn’t been at their best either. What with David getting into a shouting match after failing to pour the champagne while Dan had to calmly tell Tanorria that she wasn’t helping him by constantly yelling at him. So the judges were disappointed in the overall quality of work they saw during the first elimination challenge, but here Nathan and Shaun took the cake. The guys hadn’t been able to finish everything they needed for the picnic platter and most of what they were able to finish was inedible. Mainly because Nathan ruined everything he was supposed to finish. So the whole bottom two reveal wasn’t exactly a mystery. Nathan and Shaun did land in the bottom two however, the judges decided to send just Nathan home. Nathan was the one that made the most errors and tonight his lack of experience in the kitchen was what showed the most. Later on tonight’s double episode, the judges decided to take the contestants out of the MasterChef Kitchen. The judges had taken the remaining six contestants to a historical building downtown and there they told them that MasterChef was throwing a party. The Party was supposed to have 1920s theme and so it was bound to have a menu to match. However, it was the contestants that were going to be cooking in the pop-up kitchen that the judges set up. So once again they had broken down into team. The Red Team and The Blue Team. David and Katie had barely won the last elimination challenge however a win was still counted as a win. So tonight David and Kate both got to be team captains. Katie was captain of the Red Team and David was captain of the Blue Team. Yet, David had gotten the first pick and he had surprised many by choosing Brandi over Shaun. Shaun was considered to be the strongest competitor so everything would have thought that David would have chosen him first. And they couldn’t understand why he chose Brandi. David though had an explanation. David said that he chose Brandi over Shaun because he knew Brandi was a team player and that they worked well together. But the reason he didn’t choose Shaun was because he said Shaun had a problem with taking directions in the kitchen. So Katie ended up choosing Shaun and she had believed that David basically handed her the win when he allowed her to have Shaun on her team. But each team had to be consisted of three people so Katie didn’t feel so lucky when she also got Dan out of the bargain. Dan had shown that he could cook yet he was still a bit of frat guy rather than someone you would want on her your team. So the popup kitchens did have a few upsets. Dan struggled with following directions and he wasn’t much help as Katie struggled through plating. Though over on the Blue Team, David and Tanorria had run into a communication problem. David had been communicating with Brandi and he hadn’t been talking to Tanorria. And so Tanorria later messed up and wanted to give up because she felt like she didn’t have her team members’ support. However, Ramsay and Christina frequently stepped in when they saw problems so they told the team captains to pull their acts together. David was told that he needed to communicate more because he wasn’t a lone poker player in the kitchen and they told Katie to hand over plating if she felt like that was too much for her. So David had done as the judges suggested and he had told Tanorria that if she had a problem then she shouldn’t be silent and that it was ok to yell at him if she had to get his attention. And as for Katie, she truly believed that she could plate the dish well so she chose to stay despite the many plates that the judges had to send back. So the judges were later able to tell just who had been listening to them. David had done as they asked and had turned around the Blue Team. To the point that they were plating dishes beautifully and on time. But Katie’s Red Team was just barely scraping by. Dan was out of his element yet he really wasn’t the problem. The problem was Katie. Katie didn’t know how to steer her team properly and she didn’t know how to plate a dish even though she thought she would eventually get it. And so the Red Team was consistently handing over the dishes that needed to be returned. Either the plating was off or some of the food was genuinely still raw when they tried to serve them. So tonight Katie was able to lead her team to victory. Instead the Blue Team won the Team Challenge and it was the Red Team that had to cook in tonight’s Pressure Test. The Pressure Test tonight involved one main ingredient and that was chocolate. So the recently defunct Red Team had known that they were going to be cooking a desert with such an ingredient though they initially thought that they had a choice between Milk Chocolate Cheesecake, White Chocolate Éclair, and Dark Chocolate Lava Cake when the judges told them about all three. Yet, surprise, the judges actually wanted them to cook all three and hadn’t even given them additionally time to accomplish all that. So the three chefs in the pressure test had to cook everything within their usual sixty minutes. Though Dan had appeared to needed just a little more time than that. Dan it seems had taken several risks in the kitchen so he had only cooked one cheesecake and had messed up on his first batch of eclairs although lucky for him he hadn’t been the only that made mistakes. There were flaws in all of the Milk Chocolate Cheesecakes, there were flaws in all of the White Chocolate Eclairs, and so it was the Dark Chocolate Lava Cake that had to settle everything. Shaun had managed a perfect Dark Chocolate Lava Cake while Katie’s and Dan’s had been woefully undercooked. So Shaun was the first person that was told he was safe. But Dan and Katie were in the bottom two. And out of the two of them, the judges thought Katie should go home. Katie and Dan had been evenly matched for most of everything yet Katie had forgotten to add chocolate in a chocolate desert test and that’s what sunk her.